Whether 2017 was great or terrible for you, there’s no denying that there were a ton of new game releases last year – more than any year on record, in fact. Add those to the already hugemongous collection of quality game titles from the past few years and gamers had a cornucopia of gaming goodness from which to choose. 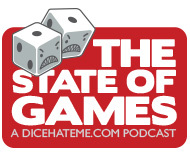 Now, there’s no way for everyone to play every single title that comes out, but we do pride ourselves on playing as many as we possibly can here on the podcast and we love sharing those experiences with all of you, dear listeners. So sit back and enjoy our takes on our absolute favorites of the past year, straight from our tables to your earholes. All three because they are games I can play with at least one of my sons – so it’s great to be able to get them to the table. The first one is obvious; I have to throw the designer a bone, you know. The second one is one of my favorite games that I ever played at UnPub and among my top five favorite games ever. And the third is just a great two-player implementation of a terrific party game that my wife loves. We didn’t ask, but we’re glad you shared, Paul! I’m not sure I know what Empires is, but now I want to find out. I have yet to play XCOM but it’s been on my list for a long time. I got a chance to play Codenames Duet at Origins before it was released and it was a blast. Nice choices!